Perhaps not as crazy as an RUF, but maybe that's OK.
Techart is one of a number of well known tuners dealing in aftermarket Porsche accoutrements. 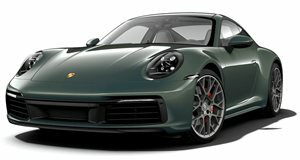 And for the Geneva show, there is a fresh example of some of the things offered for the 911 GTS. These aren't really the sorts of modifications intended to crank out big horsepower numbers, at least not in this case. The car was fitted with a new exhaust system and aerodynamic touches, but that's the extent of what could be called performance parts. The aesthetic changes are fairly obvious, there is the stripe package and a set of Techart's own Formula IV Race centerlock wheels. A bit less obvious is the Noselift system that's been installed, which is arguably the most useful thing about the car. This is an electro-hydraulic system which raises the car by 45 mm (about 1.8 inches) to go over speed bumps or poor quality roads. It works at a stop or low speeds, and will automatically lower the car back down at 37 mph. Techart has quite a few other options available, lots of carbon-fiber add-ons, and you could convince them to do a lot more if you have the money.